MedeAnalytics is the provider of healthcare analytics solutions across the the United State’s healthcare system. It’s intelligent cloud-based analytics platform combines different data streams to deliver state-of-the-art analytics, all in a business context. As MedeAnalytic’s application user count grew, their previous database became increasingly burdened; the new level of traffic increased the latency and slowed response times. 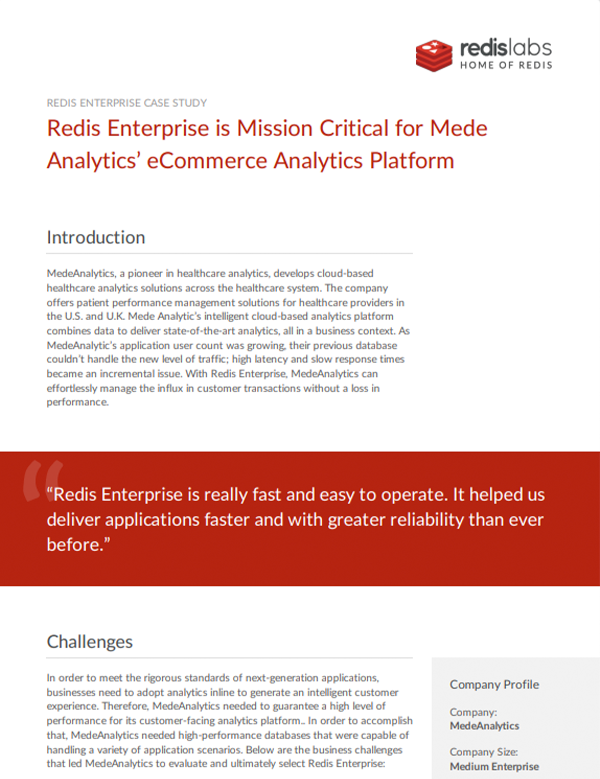 In order to boost the performance of its customer-facing platform, MedeAnalytics chose Redis Enterprise for it’s ability to effortlessly manage the influx of new requests, without any downtime or decrease in performance. A management system capable of facilitating high-speed transactions for its eCommerce application. Redis Enterprise is really fast and easy to operate. It helped us deliver applications faster and with greater reliability than ever before.